Remove kale ribs; discard. Tear each leaf into 5 or 6 pieces; place in medium bowl. Add oil; toss to evenly coat. 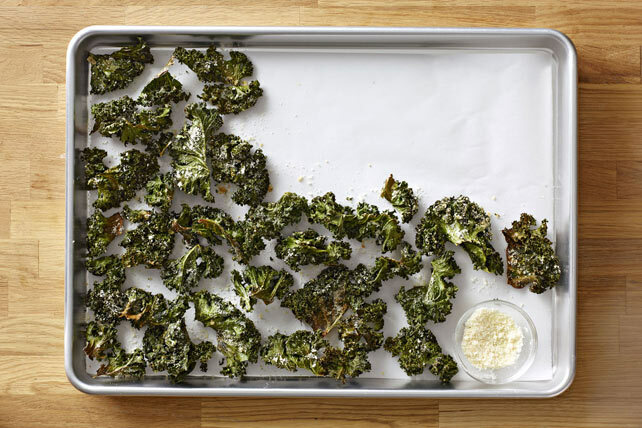 Spread half the kale pieces into single layer on each of 2 parchment-covered baking sheets. Bake 14 min., turning after 7 min. Sprinkle chips evenly with half the cheese; turn. Sprinkle with remaining cheese. Cool completely. For added zip, sprinkle with desired amount of crushed red pepper or smoked paprika before baking as directed.